My wife and I are still doing well! Right now, the forecast is 22 days of fasting — 28 days less arrival day, digestive rest day, and 4 refeeding days. This means we’re halfway there! The other way to think about it is that we’ve now survived 5 enemas! 😱 The enemas don’t really get any more comfortable, but at least I mentally know that the discomfort will be over! Getting here, my first weigh in with the nurse was at 161.7 lbs (73.5 kg) or BMI=23.2. 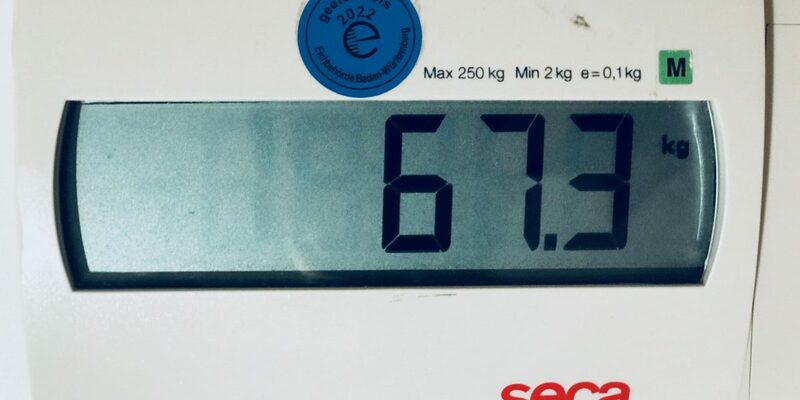 Today, I passed my weight during my senior year of high school which was 148 lbs (67.3kg) or BMI=21. Still, I have a ways to go stabilize blood pressure and to get my fasting blood glucose down. So, I need to keep sucking the liver out of my organs. This was expected, which is why I booked the clinic for 28 days! Halfway through, I can write here that so far this is way easier than I thought it would be. Let’s see how the second half of the fast goes! Great job, Stephen and Marsha! Only half more to go! While fasting, are you still taking your regular meds? I’m amazed by your blood pressure!